Every touch-point that an employee has with a company is a driver towards the overall employee experience which will ultimately move business goals. Well, as they say, "Take care of your employees and they will take care of your customers". Giving and receiving feedback is a difficult thing to do, so we sat down and looked at how we might make that a better experience for everyone. Thus, we combined Hyphen's functionalities to conduct pulse polls and the revolutionary employee voice with a progressive survey platform which lets you conduct all types of employee surveys that your organization would need. With Hyphen surveys, you can ask the right questions to your employee's, generate feedback, analyze the data and take actions accordingly. May it be the beginning of their life cycle at your company using an onboarding survey or the time they are parting ways through an exit survey, Hyphen lets you launch surveys for all purposes - Onboarding; Engagement; Satisfaction; Exit; Diversity & Inclusion; Learning & Development and all the other employee surveys you might need! These multi-purpose survey capabilities are supported by research-driven templates which have been created in consultation with the "guru's" of People Management and have proven to drive success. You can choose from the vast library of templates or create your own templates and launch a survey with a click of a button. Once you have drafted the survey you want to conduct, you have the option to launch it for the entire company, an already existing segment or create a new audience by tagging their email-id. 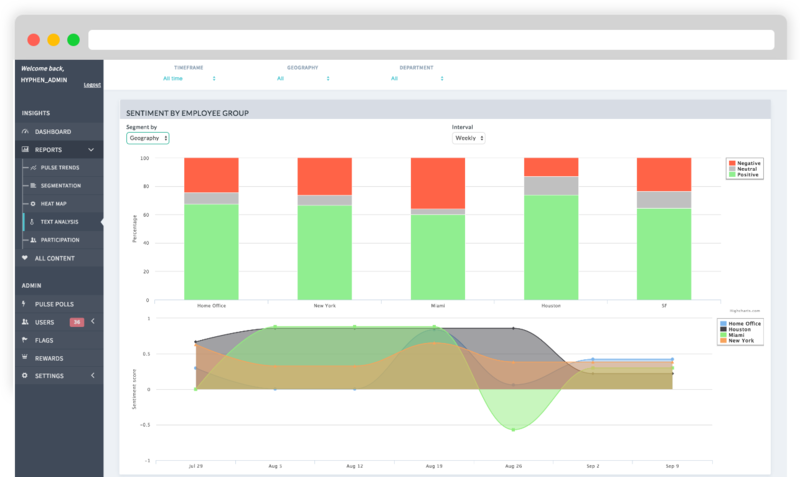 This functionality helps you ask specific questions to specific employees thus enabling you to create targeted People initiatives. One important metric which helps you define the quality of the survey result is the participation rate which in most cases do not see north of 40% (According to an industry report by Survey Gizmo). 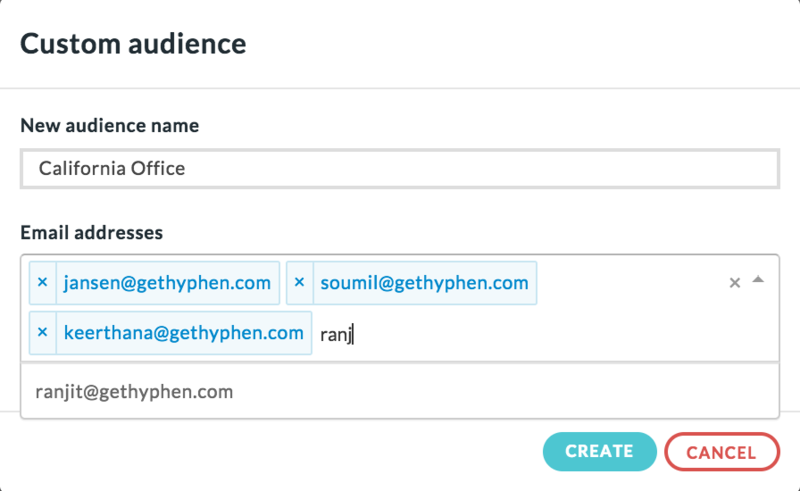 To tackle this issue, Hyphen surveys let you set automated reminders with a frequency and interval defined completely by you over emails, mobile push notifications or any other internal communication tool that you are using. Our philosophy from the beginning has been to provide customized solutions based on the company's needs. Keeping this in mind, you can now add introductory & body messages, craft creative subject lines to get higher participations, and even add your company's branding on the surveys you launch. Hyphen survey gives you the freedom to personalize it on your discretion. 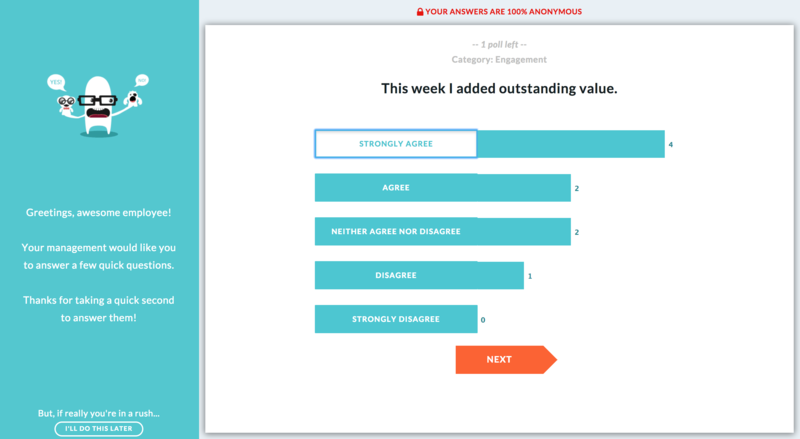 Once the survey is launched, you can see the responses in real-time using Hyphen's smart dashboard. The gold-mine of data which you just collected can be sliced & diced based on various segments (age, demography, location, office, tenure etc.) set by you, enabling a deep dive into the various pockets in your organization which need immediate attention. Not only can you analyze quantitative data (Well, who can't! 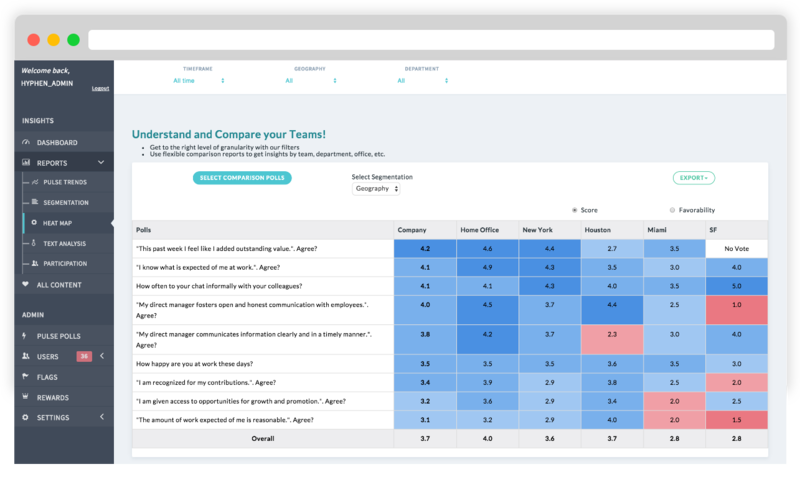 ), but also get a pulse of your company through sentiment scores based on the qualitative data provided by your employees on the surveys, with the help of machine learning which runs on every response recorded on Hyphen! Self-categorization of various topics under Josh Bersin's engagement framework for focused action. Options for skipping polls based on a trigger and showing/hiding survey results from voters. Easy to use, intuitive and seamless design!